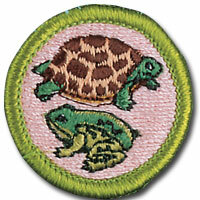 Let our staff of professionals counsel your group on the Reptile & Amphibian Study Merit Badge. We have certified counselors on our staff. In addition to completing all requirements for the badge, we can offer exclusive access to requirement 8. Requirement 8a requires the scout to maintain a reptile / amphibian for one month. Requirement 8b requires the scout observe a reptile / amphibian for three months. All attendees of our class will receive 20% a reptile purchase to satisfy requirement 8a, or can have access to our display animals to fulfill requirement 8b. Our merit badge counseling service carries a nominal fee of $10 per scout, and the class takes place at our location. We can train 20 scouts per sitting. We will provide all materials needed for the class. If you'd like us to bring our presentation to your location, please call to schedule: 618-624-8003.
a. Maintain one or more reptiles or amphibians for at least a month. Record food accepted, eating methods, changes in coloration, shedding of skins, and general habits; or keep the eggs of a reptile from the time of laying until hatching; or keep the eggs of an amphibian from the time of laying until their transformation into tadpoles (frogs) or larvae (salamanders). b. Choose a reptile or amphibian that you can observe at a local zoo, aquarium, nature center, or other such exhibit (such as your classroom or school). Study the specimen weekly for a period of three months. At each visit, sketch the specimen in its captive habitat and note any changes in its coloration, shedding of skins, and general habits and behavior. Find out, either from information you locate on your own or by talking to the caretaker, what this species eats and what are its native habitat and home range, preferred climate, average life expectancy, and natural predators. Also identify any human caused threats to its population and any laws that protect the species and its habitat. After the observation period, share what you have learned with your counselor. a. Identify at night three kinds of toads or frogs by their voices. Imitate the song of each for your counselor. Stalk each with a flashlight and discover how each sings and from where. b. Identify by sight eight species of reptiles or amphibians. c. Using visual aids, give a brief talk to a small group on three different reptiles and amphibians. NOTE: Scouts must not use venomous reptiles in fulfilling requirement 8a. Species listed by federal or state law as endangered, protected, or threatened must not be used as live specimens in completing requirement 8a unless official permission has been given. In most cases all specimens should be returned to the wild at the location of capture after the requirement has been met. Check with your merit badge counselor for those instances where the return of these specimens would not be appropriate.